It’s nearing the time of year when Love is in the air! I’ve always loved Valentine’s Day and looked forward to making heart shaped cookies and when I was younger, personalizing the little paper Valentine cards you find at the grocery store. It was always so fun to take them to school and pass them out with a piece of candy hidden in the tiny little envelope. These days I send handmade cards that are a bit more sophisticated, making use of my variety of scrapbook supplies. This year I wanted to make something using felt—a project that was easy and small. I always have left over fabrics and trims from other projects and constantly look for ways to use them up. In fact, most of my projects for the blog are created when I search my craft room to see what inspires me! So I grabbed a variety of colored felt and fabric, embroidery thread, and some beads and buttons and decided to make these small delicate ornaments that could also double as pincushions. I intend to give the ornament to a special friend and...well I think I’m keeping the pincushion for myself to add to my ever growing collection of handmade pincushions. Ready to get going on this fun project? Decide what colors you’d like for your ornament or pincushion to be and gather supplies. If making a pincushion, I recommend using some rice or small beans for part of your filler to weight it down. Make a few templates of different sized hearts and use these to cut out your layered hearts. Beginning with smallest heart, use a variety of embroidery stitches and buttons or beads to decorate the heart. I used six strands of thread for a thicker/fuller stitch. Layer the small heart on top of the next sized heart. Carefully hold in place as you use a buttonhole/blanket stitch to embellish while sewing your hearts together. Continue layering and embellishing hearts. I used a pearl bead strand and couched it around the perimeter of the second heart, while attaching to the largest heart. With embroidery thread, do a blanket/button hole stitch to attach the two largest hearts. Work your way around the heart, leaving an inch or two open for adding filler to ornament. 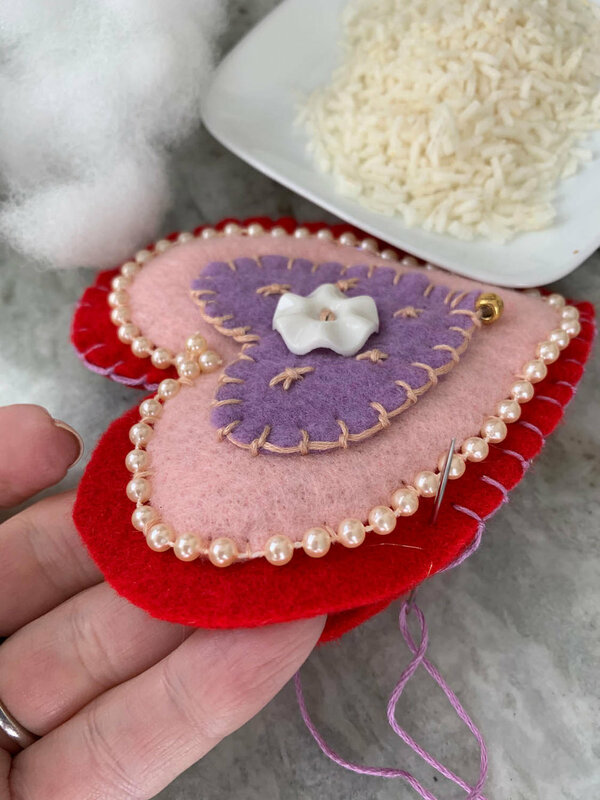 Fill heart ornament with a combination of rice and fiber fill. 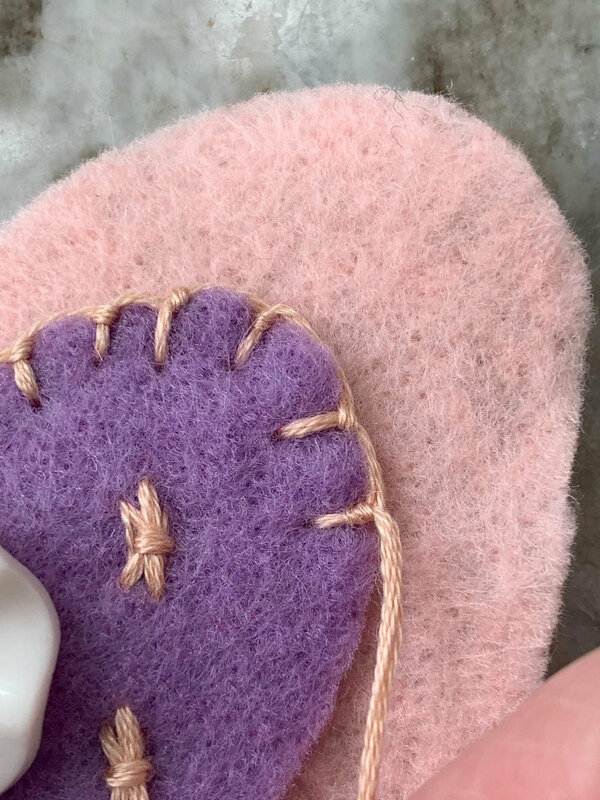 Continue blanket stitch all the way around your ornament to close. If using as an ornament, leave a long tail of embroidery thread at the center for hanging. If using as a pincushion, pull thread tightly, knot and cut thread. Now you’ve completed a beautiful Valentine ornament to give as a gift to a loved one or as a keepsake for yourself! Let me know if you make a felted heart ornament and how it turned out. I’d love to see your version!